He does look angelic. Angelic with a sparkle in his eyes! What a cutie! An angel for sure!!! Dare I say angelic and cheeky?! Either way, lovely and a lovely moment. Btw-meant cheeky smile, and in a nice way! 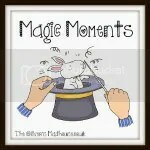 what a fantastic #magicmoment! i love it he is such a cutie! and he looked so so smart! Oh, what a handsome boy and a wonderful moment in his life! Awww! Such a special day! Matilda’s just made her First Communion too!